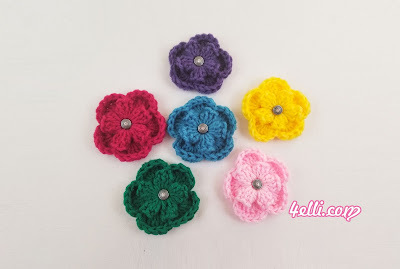 How to crochet beautiful flowers!!! Round 1: chain 5, slip stitch to the 1st stitch o form a ring, chain 3 (counts as the 1st dc), 5dc into the ring, remove the hook from last loop, insert the hook into the 3rd chain and into the last loop and make a slip stitch (1petal made), chain 2, * 6dc into the ring, remove the hook from last loop, insert the hook into the 1st dc and into the last loop and make a slip stitch (1petal made), chain 2* repeat from * to * until you have 5 petals total. To finish the round: slip stitch into the 1st petal. Round 2: *6dc into the next chain space, slip stitch into the next petal*, repeat from * to * around. To finish the round: slip stitch into the 1st petal. Round 3: *1hdc in each of next 6dc, slip stitch into the next petal* repeat from* to * around. To finish the round slip stitch into the 1st petal. please watch my free video tutorial which shows you how to crochet those beautiful flowers step by step! !